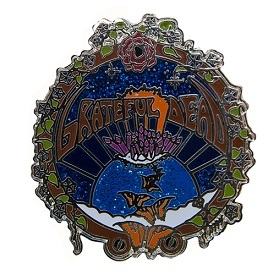 This Grateful Dead pin features butterflies and a rose and is designed by renowned artist Mike DuBois. It measures approximately 1 1/2", is made of hard enamel, finished in polished silver metal. It's also double posted, comes stamped with Mike DuBois's signature, the Kingpin Designs logo, and is individually numbered out of 200. Officially licensed Grateful Dead merchandise.